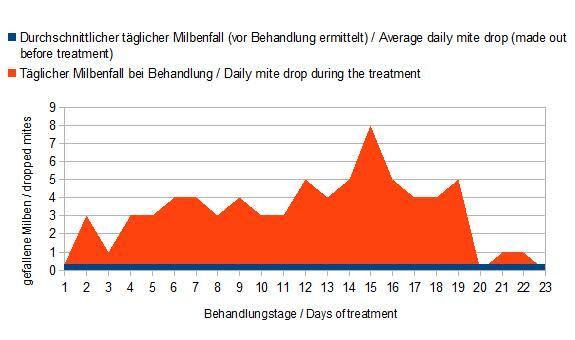 The ideal frequency range to harm the varroa mites is between 14.000 and 15.000 Hz with 90 decibel. In this range varroa-mites are extremely disturbed in food consumption, with the result that adult mites die within 10-20 days. The acoustic noise works in the brood, too. The juveniles (joung mites) are dying in the breeding cell within one day. Adult mites in the brood are violated extremely and reproduction is stopped at once. The next picture shows a treatment, now running in Berlin. 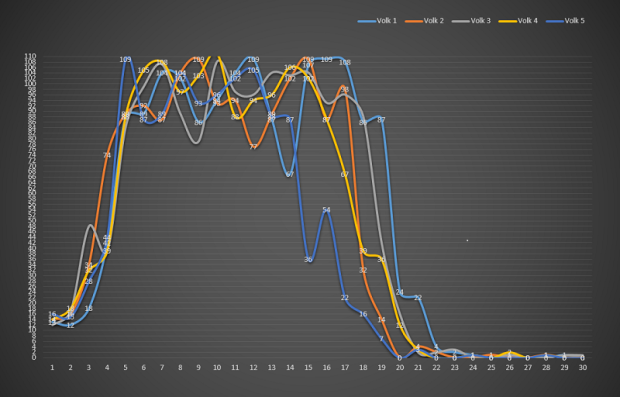 Comparing the mite drop before and during the treatment, the effect becomes clear. 74 dropped mites during the Varroa-Killer-Sound Treatment.